Protecting your staff with appropriate machine guarding is the law! Machine Guarding is essential for the safety of your personnel and to protect your critical equipment from accidental damage. Profilium can design a fully customised machine guard to suit an existing, in-situ piece of machinery or we can provide customised machine guards for new machines. Machine Guarding can be simple or complex, but using t-slot extrusions can make the task much easier and flexible and results in rapid fabrication of your machine guard. By using our CAD software to combine modular sections of aluminium profile, a complete assembly can be designed quickly and simply. By choosing a special “panel slot” aluminium profile, panels including clear poly-carbonate, solid composite materials or steel mesh can be accommodated within the aluminium profile sections. We can even utilise a patented Quick Release Panel System (see the second Tab) developed by our partners Alusic for easy removal of safety panels for maintenance, but yet which remains fully secure to maintain your full safety requirements. Aluminium profile is an ideal material to create a machine guard. With the option of "closed face" profiles or multi-slot profiles, you can pick the right style and size of profile to suit the aesthetic and load requirements of your machinery. Closed slot profiles will give your product a smooth, professional look and are ideal if the guard is used in a clean room or other environment where a smooth surface is required. Multi-slot profiles are ideal for mounting equipment, cameras, lights, scanners and sensors. When required, it is also easy to use both profiles types on the one machine guard. T-slot profile is also ideal for mounting polycarbonate or mesh safety panels that creates the safety zone within the machine footprint. In most cases the polycarbonate panel or mesh simply fits into the profile slot by itself or with the help of a rubber sealing gasket. Aluminium profile is also lightweight, strong and doesn't need welding which means it won't distort and you don't need a hot works permit to make modifications on site. Speaking of modifications, the nature of the t-slot profile allows you to easily modify the guard at any time in the future - for example if you extend a machine or conveyor. Original Equipment Manufactures (OEM) we an design and build a machine guard to suit your machinery. Frames can be supplied fully built or "flat packed" for easy transport. For large volume orders we can offer staged delivery or deliver the entire consignment in a single dispatch. Need to speed up your design process? We can share our CAD files with you to make designing your machine guard that much easier. Simply sign our Non-Disclosure Agreement so we can protect Alusic's IP. Find out more HERE. As all Business Owners and Managers know, safety panels are now mandatory for most industrial machinery applications as either a machine guard to prevent personnel accidentally inserting their hand or limbs into a pinch point or cutting area; or to provide zoned safety fencing around a machinery cell. Aluminium profile is the most common material used to provide these mesh or polycarb safety panels, however there has always been a problem in removing these panels to undertake routine maintenance or cleaning. 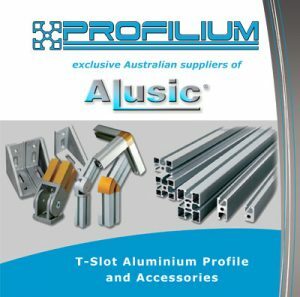 We have a solution – PROFILIUM can offer a revolutionary new quick release closure system for the rapid access and removal of aluminium profile safety panels. Patented Quick Release Panels Enter the patented Alusic quick release system! The Alusic safety release system is an innovative safety catch that allows for the rapid and safe removal of aluminium profile safety panels surrounding your machines or safety cells. The system is WHS compliant as you still require a tool to safely remove the panel. 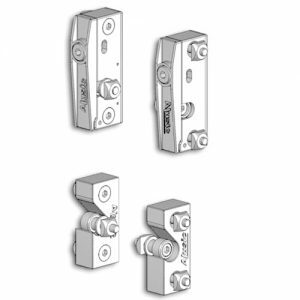 These innovative quick release catches are sold in kit form and include the 2x top, 2 x bottom hinges and 4x locking pins. 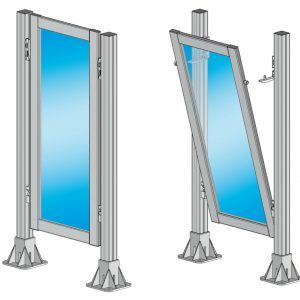 Simply use your allen key to quickly and easily install these innovative quick release catches for aluminium profile safety screens. Safety Panel Hinge Kits can also be be purchased separately HERE.